Cardiff University is playing a leading role in a series of events marking the 1,600th anniversary of the end of the Roman occupation of Britain. As part of the UK-wide AD 410 project, archaeologists are reopening an excavation at the site of a Roman fort at Caerleon, Newport. 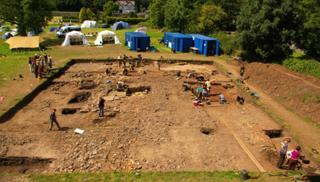 During August they are offering the public a chance to tour the Priory Field site and join in with the dig. The university will later host a two-day conference on Wales' Roman legacy. The AD 410 Romans Go Home celebrations have been organised by Cardiff University in conjunction with the Association for Roman Archaeology, the British Museum, English Heritage, the Roman Society and the Society of Antiquaries. Terry Jones, who directed and appeared in Monty Python's classic film The Life Of Brian, is also involved. "It was an idea that came from a couple of colleagues from London who noticed that 2010 was the 1,600th anniversary of the supposed abandonment of Britain by the Romans," explained Dr Peter Guest, senior lecturer in Roman archaeology at Cardiff's school of history, archaeology and religion. "We hope people will be interested in the events that are happening. Some will be more for the academic but we hope anyone who feels interested in what we have to offer will come along and get involved." The Romans first landed in Britain in 55 BC, and launched a larger-scale invasion in AD 43 under Emperor Claudius. Though there is some doubt as to the exact date of their departure, most historians have settled on AD 410. "No-one knows exactly when they left," said Dr Guest. "The history of the end of the Roman occupation is cloudy and leads directly on to the Dark Ages. "But there is a late Roman historical source, written by a Greek historian, which says that the Roman administrators left Britain in AD 410 and never returned." A range of different events have been planned across the UK, but as Dr Guest explains, Wales has a special part to play. "There are various excavations ongoing that seemed to be focusing on the end of the Roman period and Caerleon is one of these," he said. "Our dig there two years ago showed interesting results from that period so we decided to tie in another dig there. "In Wales the idea of a Welsh identity starts as soon as the Romans leave the island so there are some important questions about Wales and Welsh idenity involved in this." Dr Guest and his team of archaeologists are returning to dig for a second and final season on the site of a large warehouse in Priory Field within the fortress walls. Once home to the Second Augustan Legion, Caerleon was one of only three permanent legionary fortresses in Britain. The dig is being thrown open to the public from 9 August to 17 September and regular activities will include twice-daily site tours led by the archaeologists. Dr Guest said there would also be a chance to help out with sieving and cleaning and an opportunity to quiz the archaeologists about their work and finds. Over the the bank holiday weekend, 28-30 August, there will also be tours and practical activities, along with displays of the latest finds and a 'mini-dig'. Between 30-31 October the Cardiff's school of history and archaeology will host a two-day conference focusing on the Roman legacy in Wales.